Fortunately, places like Oix and Beget still exist. They are like two tiny villages disconnected from the world in which we live, but closely connected to nature, silence, history and traditions. Oix and Beget are worthy of a mention simply due to the peace and quiet of the high mountain region, the landscape with impressive cliffs and large holm oak and oak forests, as well as the wonderful Romanesque art found in them. In Oix, the church of Sant Llorenç and the remains of the old castle preserve their essence despite the passage of the centuries. 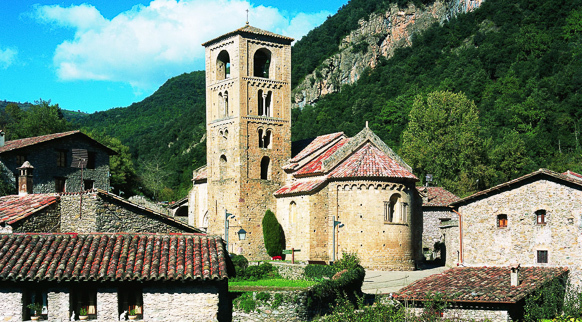 In Beget, the church of Sant Cristòfol is a relic from the pre-Pyrenees Romanesque style, built in the 10th century. Inside it, you will be able to see the famous wooden carving known as the Majesty of Beget, one of the most beautiful ones in the whole of Catalonia.